Rocks are hard. Sun gives warmth. Crocodiles are evil. These statements are but a few of what I believe. Of course, you will have a hard time convincing me they aren't true. But that doesn't mean you can't try. As much as we always want to be right, we aren't always right. The act of exchanging or questioning ideas serves a useful function in our lives - it helps eliminate or weaken bad beliefs and upholds good ones. Also, there is nothing as boring and life-sucking as being in a place where the same obvious ideas are repeated over and over. Humans grow best when even the most established of doctrines and facts are examined and debated to test their solidity. Hence, even though convincing me of the cuddliness of crocs might be a hard task, the discussion itself is a useful thing to have... just in case my belief is a cover up for crocodyliphobia. "Searching For Happiness by Martin Thielen" is a book that treads a well-beaten path, but does little to add to the body of knowledge already out there. There is nothing jumping out of the pages to catch you by surprise. There are no controversies or attempts to poke holes into existing mainstream arguments about happiness. "Searching for Happiness" plays it safe, and as a result falls short of its potential. "Many people think, If I can just get rich, I'll be happy. But that's not true. Extensive research has proven that after our basic needs are met, additional money has minimal impact on our happiness. In his book Flourish, Martin Seligman, a psychologist and an expert in happiness studies, cites amazing research. Pennsylvania Amish, Inuit people in northern Greenland, and African Msai - people who have minimal income and few material assets - have virtually the same levels of life satisfaction as Forbes magazine's richest Americans. In spite of beliefs to the contrary, after our core necessities are met, money does not make people happy." The book then goes on to tell us alternative ways to improve our inner happiness as well as remaining happy irregardless of our outer circumstances. It says when it comes to happiness, the happiest people practice optimism, forgiveness, generosity, gratitude, cultivate optimism, nurture relationships, care for their bodies and soul, focus on the present, and use trials as growth opportunities. The author expands on these lists, telling us how to practice each of them and giving real life examples of people's actions in the quest for happiness. "Searching For Happiness" is easy to read and its approach is down-to-earth. Though the author references science, theology, psychology and real life situations, the writing style he uses is simple and strong enough to convey his points. "Searching For Happiness" does not bore you with jargons or long sentences, neither does it pretend to be highbrow and talk down to readers. Apart from the sin of the repeating the obvious, one of the letdowns of this book is that it feels overloaded with quotes and anedotes from "experts". The book regularly quotes scientists and experts for validation in a way that makes me feel the author is insecure in relying on the strength of his own observations and the Bible (I included the latter since the author intended the book to be in a Christian category). In a bid to be balanced as well as lend its arguments some validity, "Searching for Happiness" panders to philosophy and science. Because the writer isn't owning his statements, I found it difficult to take him seriously. This subsequently led to boredom as I struggled to finish the book. Make no mistake though, "Searching For Happiness" is a good book that reiterates obvious points on a subject that is in demand. 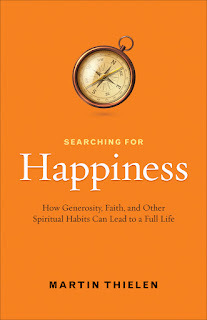 Though I believe the author is a little bit guilty of accommodationism, this is still a good book and has some basic things to remind us about happiness and how to find it. Many thanks to Westminster John Knox Press for review copy.